You're on an archaeological expedition in the Egyptian desert. A fierce sandstorm suddenly kicks up, blowing sand all about. in sand for thousands of years, has been partially uncovered by the winds! three pairs of buggy little eyes peering back at you! 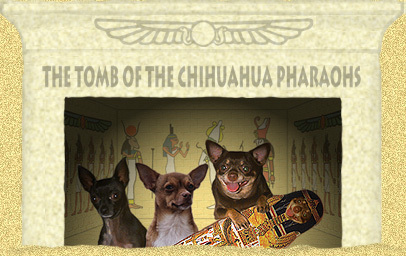 "Welcome to the Tomb of the Chihuahua Pharaohs! and we'll even show you how mummies were made!" You hesitate. Is it safe to go in? Do they bite? and they're all still alive!" so you decide to enter the tomb!